07.49 am – Ended back at Breakfast Bar as Champur Champur was closed during the Ramadhan perion. Today, we sat at the hut. My nasi lemak and Nescafe. 08.20 am – Overspent buying duty free stuff during the 2nd day. 09.16 am – Went to Teluk Baru/Dalam jetty for the island hopping trip. Managed to get the price of RM25 per person from Hanif the taxi driver of Day 1. Call Harun at 0124078370 to arrange if you ever go. Others will charge you RM35/RM40 for the same thing. So, why not? Our boat captain for the day. The edge of the jetty from the boat. 09.47 am – 1st Stop. 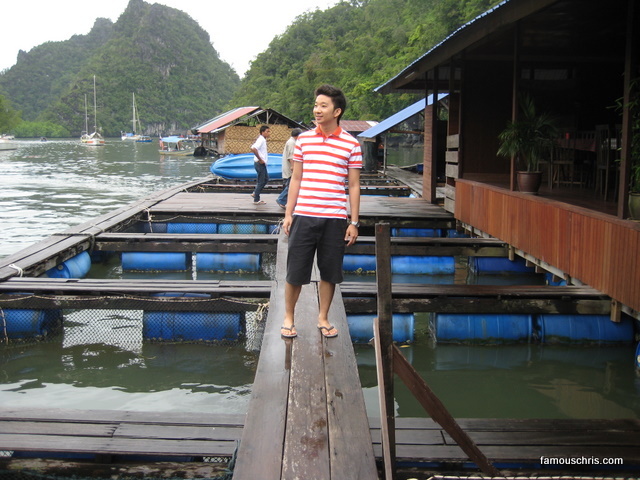 Dayang Bunting Marble Geoforest Park. the Lake of The Pregnant Maiden / Tasik Dayang Bunting. The edge separating the sea from the lake. As there was still a lot of time, we decided to rent ourselves a solar powered boat. Was surprised when the person behind the counter, who kept insisting that we rent the solar boat, pushed the price down to RM20 for a solar boat (jackets included) when we sounded more keen to rent a pure paddle boat. Captain Vivian Tan was having fun paddling her way around the lake. 10.58 am – And then we left the jetty and headed to the part where you can see the silhouette of the pregnant maiden. Why can’t it be Pulau Awek Gemuk? 11.05 am – Next stop, eagle watching. 11.20 am – Hung around for 10 minutes before docking at Pulau Beras Basah. into the bushes where I offloaded myself. 12.54 pm – It was almost 1pm when we reached the jetty. We were hungry as hell at the time and couldn’t care less where we ate so we just hopped into the next open restaurant which was Haroo Bistro. We were lucky to have had an air conditioned empty room all to ourselves. 03.59 pm – Caught Marc in the midst of cleaning the grounds of Pondok Keladi. spent some time chatting with Marc about his life, about how he ended up at Pondok Keladi and about how he loves the cheapness of liquor and ciggys in Langkawi compared to the British pound. 06.09 pm – Arrived at the departure hall of Langkawi International Airport. Checking in at the counter. The row of check in counters. Our plane arrived earlier than expected. 07.01 pm – Bye bye Langkawi. It’d be years before my next trip back here. 08.00 pm – Got picked up by Dad and went for dinner at one of the most delicious nasi kandar chain restaurant in Penang. 09.08 pm – Started unpacking. 09.36 pm – The amount of images taken were literally in the thousands! Caution : There are 121 pictures in total. Hit F5/refresh if you ever get stuck. some apple juice for breakfast. 09.39 am – After getting ready, we headed out of our room to our car and discovered 10 cockroaches trapped in the cockroach trap set up last night. 09.48 am – Arrived at one the only few Langkawi restaurants opened for breakfast, Breakfast Bar. Good morning in different languages. yellow noodles (this one was delicious!). The bapuk buffalo at the entrance. Vinny had banana pancake butter syrup. Vinny took over the wheels of MAX for about 1 hour. Today I learned that dragon fruits grow off the edge of it’s branches. I wanted to buy a few for myself but too bad the workers there couldn’t understand a word I was saying. 12.08 pm – Arrived at Kilim Jetty. Called for the free boat ride to the floating Hole In The Wall Restaurant. Hole In The Wall who was on the way to deliver goods to his restaurant. I liked the fact that it was a fish farm and we could pick our food live. RM forgot but this was very delicious! 01.19 pm – Actually, we planned to go island hopping at 2.30pm but too bad it rained. a fancy hotel hidden far, far away from civilization. A night here costs RM2000. The two horses at the lobby. small frogs. Full of it. The whole hotel was filled with all sorts of art like sculptures in the lobby and glass paintings on the wall. The rooms from the outside. 03.15 pm – Next stop, The Andaman. Another RM2000 a night hotel. The toilet was as high class as The Datai. But still, credit goes to The Andaman as it was much more posh and grander than The Datai. The Andaman rooms are also slightly cheaper. The entire place was filled with greeneries.